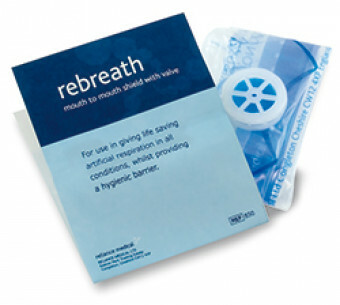 Purchase 50 or more CPR Face Shield - Valve Type - (Pack of 50)s and download your free support pack worth £100. 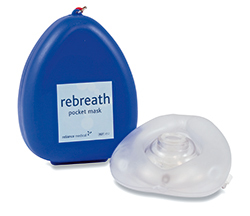 Purchase 200 or more CPR Face Shield - Valve Type - (Pack of 50)s and you can have personalised covers absolutely free! A single use mouth-to-mouth face-shield barrier with a plastic one-way valve. Unlike some resuscitation face-shields on the market, this one does not significantly increase the resistance to airflow. Nigel's tip: If you have a face-shield with a valve in your first aid kit, try to blow though it! Unfortunately many on the market are very difficult to blow through, which makes using them for mouth-to-mouth nearly impossible! Some have a hole smaller than the diameter of a drinking straw! If your existing face-shield is difficult to blow through, throw it in the bin and buy one of these!